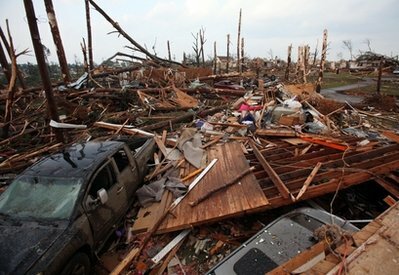 My heart and prayers are with Tuscaloosa this morning. Pretty southern community and home to the University of Alabama and Stillman College. A gentle town of good people, hardworking with fierce southern pride for their heritage,their faith and their community. A glorious Saturday for this Easter weekend. Temps in the 70s and beautiful blue skies. Sis joined me as we ran around to one of my favorite haunts for seeking out treasure. I never know what I am going to find when I go to this place but it rarely disappoints. A marvelous blue transfer ware souvenir from Lincoln's boyhood home in New Salem, Illinois. Circa 1930s. Priced at $1.00 - as is. Only "as is" was that it was filthy. Cleaned up bright and blue and no issues. Adorable little sea washed blue sled with bird figurine. Signed Marjolein Bastin. How sweet is this little Tiffany style votive lamp? No more then about nine inches in height, it is made well and would look darling on a patio. Pretty Edwardian day dress that is dyed a pretty pink. First time I have come across a day dress dyed a color. Sweet 1930s framed picture of child with small chick. Nice vintage pyrography box with painted details. I love these pretty boxes that were so popular at the turn of the century. Perfect for hiding gloves, collars and other treasures. Is this a pretty little change purse? Nope, it's a Salesman's sample of a change purse. No bigger then 2 inches by 2 inches. Pretty pastel Pfaltzgraf footed cake plate. Perfect condition and only $4.00. This cake plate is huge and very heavy. Can't you see a big, homemade coconut cake on this? I sell these footed, silverplated trays as fast as I can find them. This pretty pie crust edged tray is in marvelous condition. Sweet little Lenox rabbit from the jewels collection. Pretty turquoise and gold decoration. Marigold Carnival Glass sherbet cup and a tin shabby cottage box. Pretty, pastel roses on lid. And the best for last. This incredible antique, mantle clock. Heavy piece. Spelter angel with child and gold leafed base with faux marble trim. Clock works but needs new crystal. Close up of gold leafed base. Close up of statue. 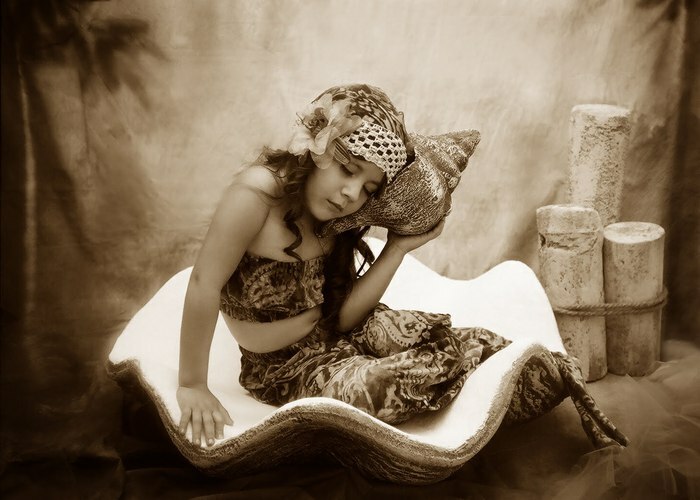 This is such a lovely piece. I can't wait to have it restored and get this in my Victorian booth. Down by the ocean, where my spirit's set free. 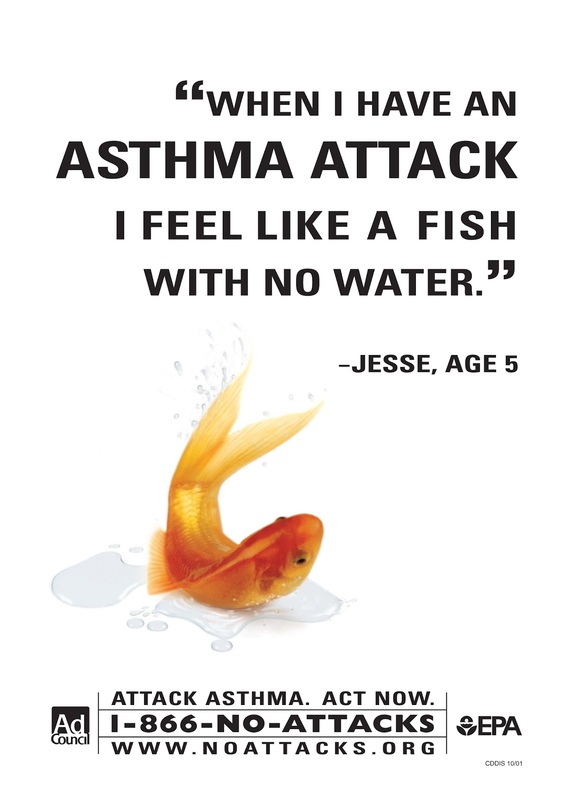 It was a beautiful Atlanta weekend and I missed most of it with a nasty cold that turned into asthma. 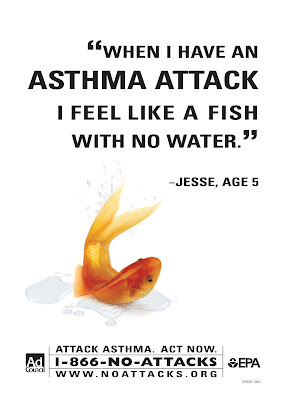 As Jesse states so clearly on this famous poster for asthma...I feel like a fish with no water. LOL...I know, can I fit anything else into it? OMG, what a difference. So much storage for our books and photo albums and CDs and DVDs and you see none of it. Love that clean look. Now all I have to do is get my shelf displays together...I just tossed them in until I could do just that. After a few hours of this change out, I was feeling tired after yesterday's asthma attack so I stopped for the evening. But don't ya just love it? My honey and I sure do. It's the little things ya know. Now, that I have it, I'm thinking it could use a faboosh makeover in a distressed, seawashed blue green. We shall see, that may be a job in the future. So, do ya know anyone who can use an empty, solid oak wall unit? It's on castors for easy moving. 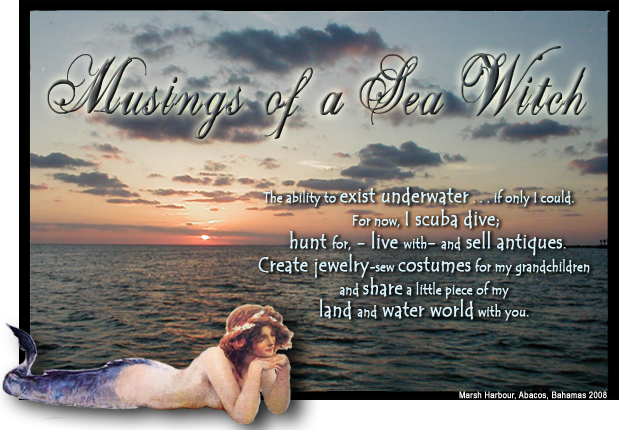 Have a wonderful week all from the "I can breathe, Sea Witch!" 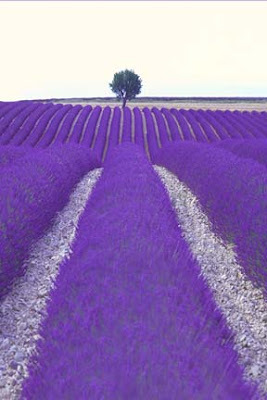 I want to lay in a field of lavender. Hit my favorite place for hunting down treasure and this week did not disappoint. Found this pretty little glass terrarium cottage. Filled it with sea shells and added a pillar candle. I think these glass pieces look great on a patio or deck with flickering candlelight. Smashing set of Georgian, cut and etched crystal wine goblets. What a find. I adore Victorian glass and these are rainbow stealers at their best. The light that hits these and the spectrum's that fall are amazing. Adding your favorite wine will make your table sparkle. Even the stems are cut. A set of 5 from the same estate only in champagne glasses. Sparking wines will never look better when served in these antique beauties. Jumped on these sweet, velveteen birds. I saw these at the Scott's Antiques Market three weeks ago and they wanted $22.00 each. I grabbed all three for $3.50 and priced them at a much lower amount then Scotts. They are so adorable. Check out the sign on the ladies room door at the Mexi/Cuban-place my sister took me too. Oh, yea, it was a Sea Witch restaurant. We headed out to a local Goodwill following a fantastic lunch at a local Mexican/Cuban restaurant, found some great items to put in my booths. Not old, but a nice "Pottery Barn" or "IKEA" bent wood desk chair. Hey, it was for $5.00, I had to get it for the store. Someone may be looking for a nice desk chair at a great price. Couldn't believe my Goodwill luck when I found this fantastic Tuscan design, heavy chandelier. Heavy and well made, this was a steal at $13.00. I do well with lighting so I am always looking for interesting pieces. Sold two small tables so I had to do a rework to my booth. Wanted to bring more splashes of spring/Easter color and this colorful Tussah silk sari did the trick. Would be perfect as at table covering or a window drape. Delightful vintage soft as butter suede jacket from the 1970s. Bound button holes and lining are in excellent condition. Jacket looks like it was never worn. I like the peaceful Buddha head next to it. Brought in an Edwardian day dress. This was all handmade with beautiful hand embrodiery on the front skirt, the bodice and the sleeves. Lots of hooks and eyes on the reverse. A wearable size and in excellent condition. A better shot of it in my Victorian booth. I topped it off with this antique silk opera cape. Will it entice the vampire crowd...it should! I cleaned and pressed this lovely battenburg lace collar I found at Scott's Antiques several weeks ago. I love this type of needlework. I imagine it was worn over a dark, silk day dress. Hung this lovely and hard to find, Egyptian Assuit shawl from the early art deco period. Fine mesh is filled with silver elements making this a weighty piece. I have seen these in black and creme but never in this faded pink color. A closer photo of the silver element work. It's been a beautiful day. Pass it on. It was my honey's birthday on Friday (He's my handsome April fool) and so I took the day off from work and we spent the day driving to Clarksville, GA. This was our first sunny day after nearly 12 days of rain, a little windy and everything is coated yellow thanks to the popping Georgia pines. The dogwoods are in full bloom. Splashes of white and pink everywhere. We are outside of Gainesville and my honey saw this sign. This is how I spell my name so I had to snap a photo of it. We were just outside of Cleveland, GA when we found an antique store. Had to stop in to see if I could find any treasure. Found this sweet little pair of fairings made in Germany. Pink lustreware baskets that say "from New York". A lovely Victorian silverplated hair mirror. Heavy piece with architectural mirror. A huge, late Victorian buffet runner. Pretty gold bullion lace edging. Following lunch, we headed out to Clarksville. Pretty little town on a small city square so typically found in these small southern towns. They are charming to see. Immediately saw a few antique stores so my honey pulled into a parking space, grabbed his book to read and I hit the streets to find more treasure. Love the brick walkways. This lovely window display caught my eye immediately. I adore soft paste pieces and these two center platters are marvelous examples of this utilitarian ware. I entered the door and discovered it was a basement location, so down the stairs I went. I come upon workman and empty space other then the center check out counters. Seems that "Parker Place Antiques" was undergoing renovations. A mother and son operation, they apologized for the "mess" but said if I went out the back door, took a right and just past the restaurant, I would find where they temporarily located everything until the shop renovations were completed. I love a good treasure hunt, so out the back door I went, a right turn and walked past the restaurant and a left and then the second door on the left and I found it. The temporary location and I couldn't wait to walk in. This lovely cupboard filled with American pieces greeted me as I crossed the threshhold and I knew that this was going to be a wonderful place. I adore 18th and 19th century American pieces. I am surrounded by beautiful pieces. I could take home most of what I see. If you are one of those people who loves to live with American antiques, then a trip to Parker Place Antiques is a must. I settled on three items to take back with me. Found this lovely, antique carnival glass piece. The lustre is fantastic. Purchased a sweet little Victorian secretary's desk. Learned that it belonging to a Clarksville judge's secretary. Will be removing the alligatored finish next weekend and will hand rub it with oil and beeswax to restore the golden oak patina. Photos will be forthcoming next week. As I was returning to the main shop to check out, I spied a huge basket full of antique hooked rugs. This jewel insisted I take it home. I will return to this lovely shop again before the year is out. Parkers had so many lovely things. My honey and I had a lovely time roadtripping. Hit a couple of yard sales the rest of the weekend and found treasure there as well. A wonderful bust of the peaceful Buddha for a garden or patio. Had to bring in more vintage photos in frames as the first group sold out. I added some pretty pieced log cabin quilt blocks from the 1930s for color.